I’m tired of trudging through the snow in my pjs during cold, dark mornings to let the chickens out at sunrise. I’m also tired of rushing home in the evenings to shut their pop hole and worrying about the wild temperature swings we have here in the Front Range. 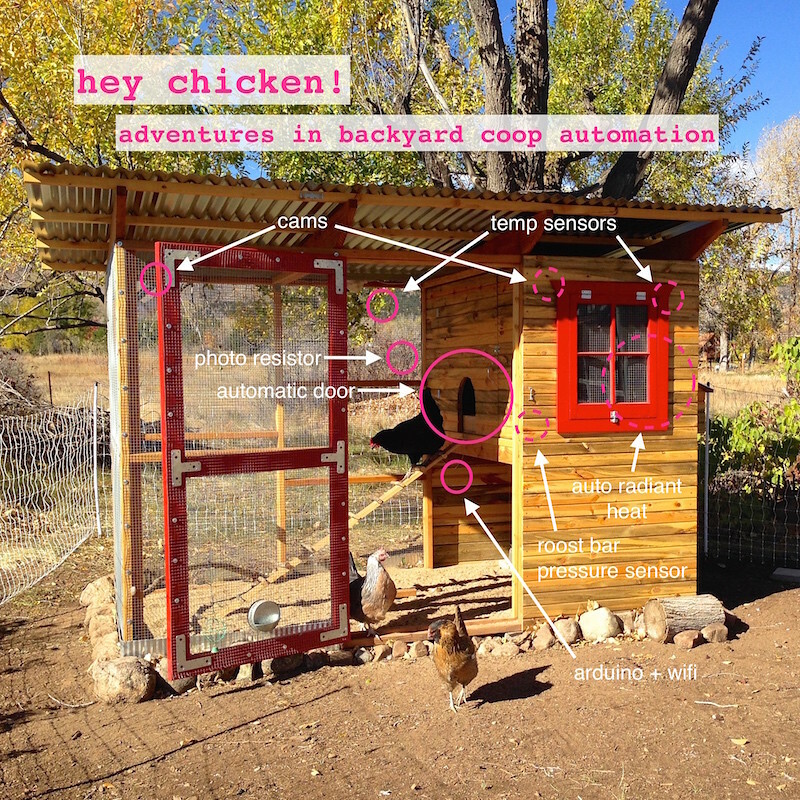 So, I’m finally doing what I’ve been threatening to do for some time now: automate the chicken coop!! What will that look like? 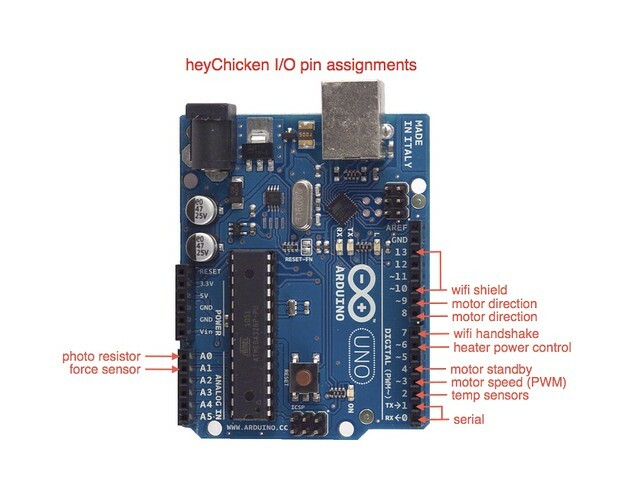 Our design uses an Arduino Uno + Wifi Shield + various sensors to detect the state of the coop like temperature, light, and whether the chickens are roosting to ultimately determine what the door and heater should be doing at that moment. The Arduino controls the motor that opens and closes the pop hole door and switches the heater on and off. A server application running on an iMac controls the Arduino wirelessly over the local network. The server functions as the “brains” of the operation and runs the automation based on the coop conditions the Arduino is reporting. 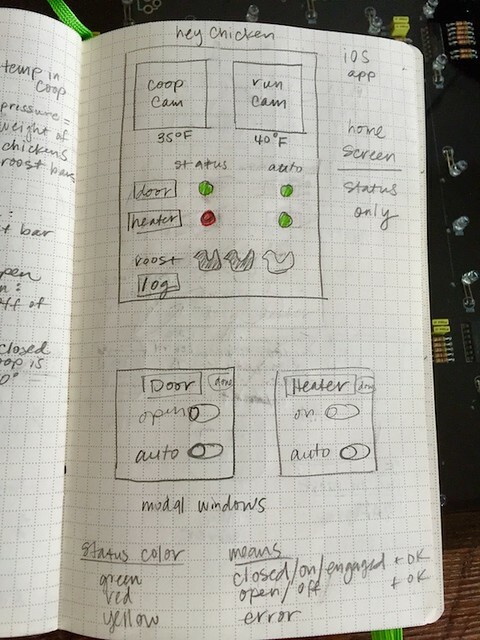 I also plan on creating an iOS app to remotely monitor and control the coop via the server. Luckily, I have a great group of folks who are working with me on this project – Jason in Oakland and my husband Nathan. We are collaborating and sharing our work on github. Data gathering: Write a server daemon to request sensor data from the coop and store it in a SQL database. Generate plots for analysis. I’m interested in the light measurements vs. time all the birds have settled on the roost vs. what time the internet says the sun sets/rises vs. the weather conditions (i.e. sun/clouds/rain/snow) vs. the inside/outside temperatures. Construct the door assembly: Build pop hole door which will slide or rotate (vertical operation will require some additional mechanism to hold it in the open position). 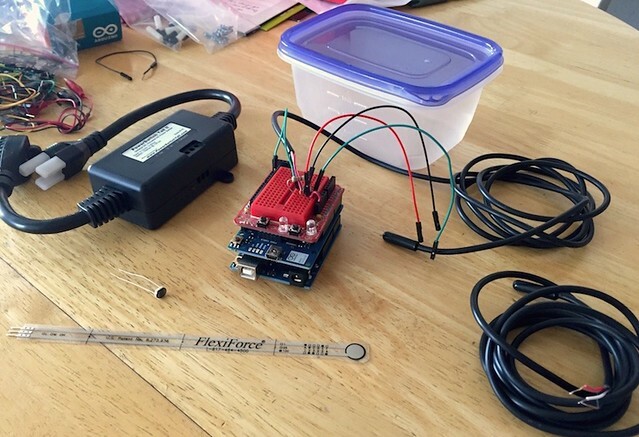 Connect motor, motor controller, and bumper sensors to operate the door. No locking mechanism is required since this door is inside of the closed run. Automation: Derive robust algorithms for opening and closing the door and operating the heater (thermostat). Implement on the server side. Detect and log error conditions. Send SMS messages on errors. 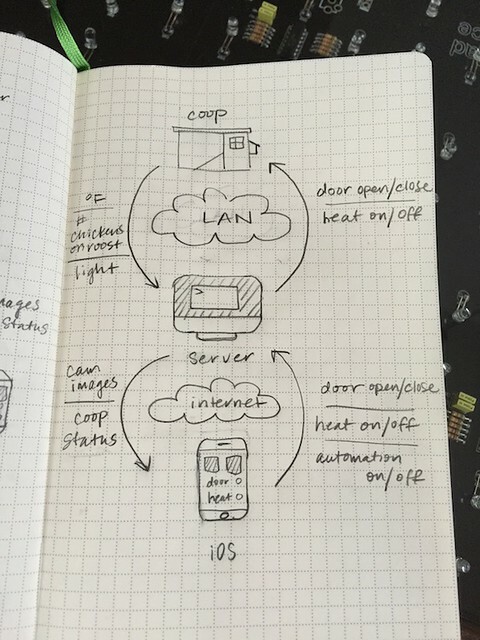 iOS control app: Write an iOS application that serves as a control panel for the door/heat and associated automation, as well as displays current webcam images (cams already installed). Chicken coop building has been a whole new experience for us at 5500 feet next to the Rocky Mountains. 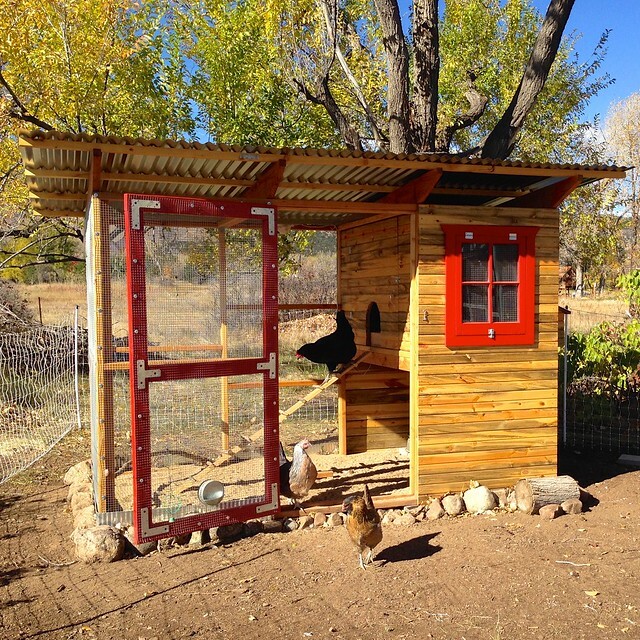 We based our design on the Garden Coop and added some external nest boxes like our old coop in SF. 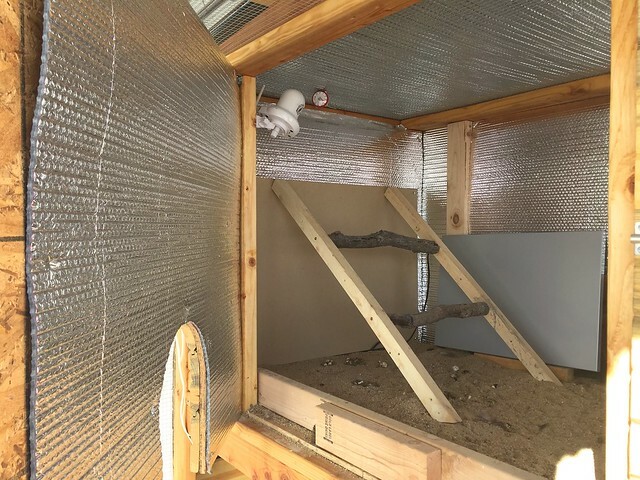 We used coarse sand in the run and coop again which continues to keep things tidy…now with the added benefit of buffering against the wider temperature swings here. 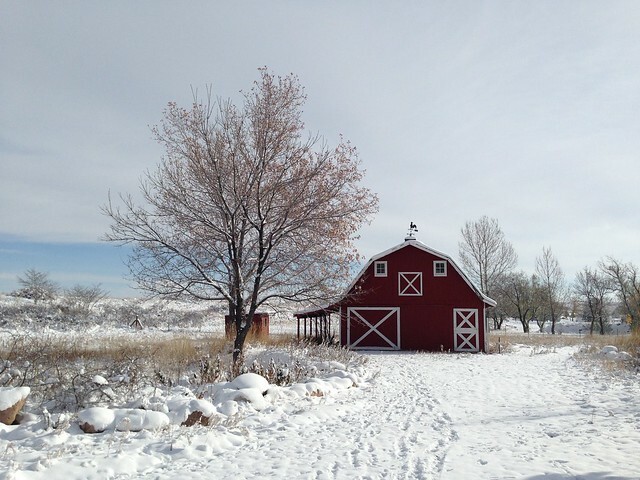 To beef it up, we chose metal roofing instead of plastic for heavier snow and wind loads. The chicken yard is enclosed with a portable electric fence to keep out coyotes and bears. Yup, black bears! They destroyed our neighbor’s bee hives even with an electric fence so fingers crossed our chickens will stay safe. It’s the real deal out here. Our property borders on Left Hand Creek which serves as a wildlife corridor. 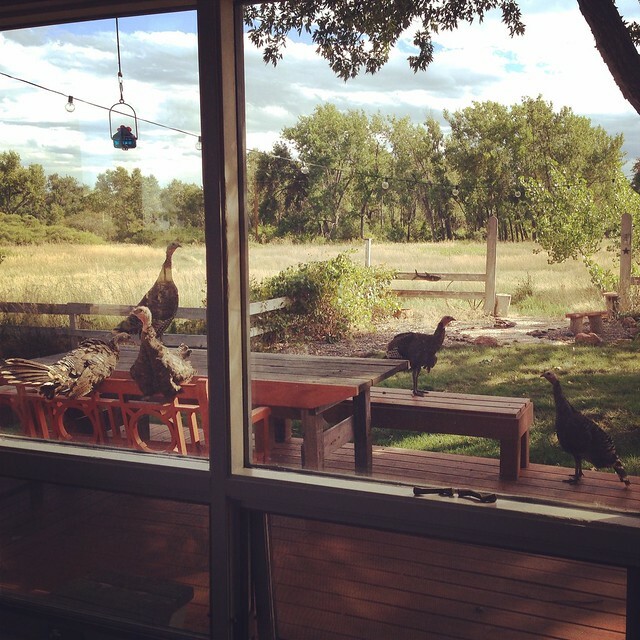 It’s neat to see the turkeys, deer, bunnies, but we also share this land with bears, coyotes, and even mountain lions. Last week, we got a major wake up call. The temps dropped into the single digits (high) and a foot of snow fell. T-rex decided to molt big time just when she needed her downy insulation the most. 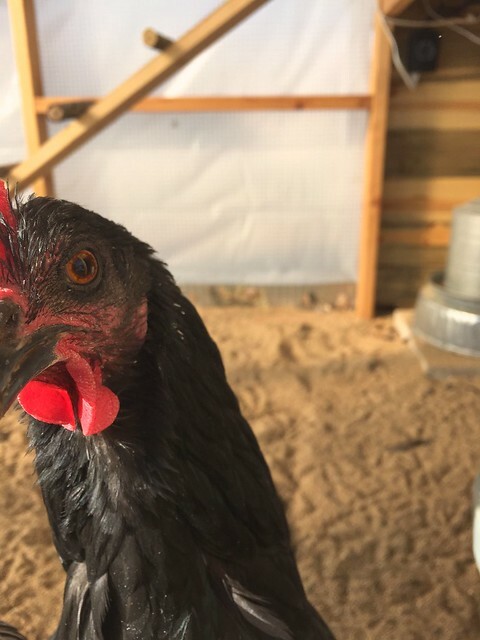 After one night out in that weather, I found the chickens motionless huddled in the coop, T-rex shivering with some frostbite on her comb. So we had to bring everyone into the basement for a few days of r&r while we added some insulation to the coop. We selected this foil covered bubble wrap stuff which was not only effective but way easier to transport and install. I don’t know why you don’t hear about this product more on the backyard chicken forums. It isn’t that pricey and doesn’t require covering since the chickens can’t eat it (unlike the pink stuff). So far, we have only installed one layer of insulation and that’s working well. We also wrapped the run in clear 6 mil plastic which creates a wind barrier and greenhouse heating effect. I know you aren’t supposed to heat a chicken coop for a number of good reasons (fire risk, power outage, etc.) but we feel more comfortable having a supplemental heat source ready for temporary use in exceptional cases. For that purpose, I bought this low power 100W radiant flat panel heater which has a low fire risk. We are using it briefly while T-rex is naked. 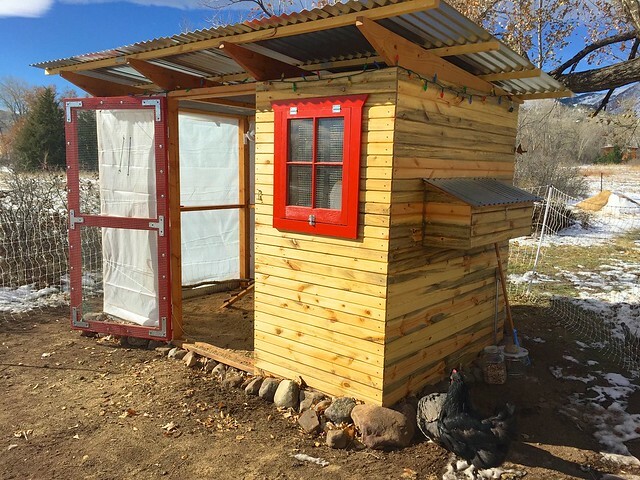 Here are some pics of the coop retrofit that I took today, minus the snow since we’ve had two days of balmy 40 degree weather. If you are wondering about the dark patches in the siding, we used local pine beetle kill siding. The pine beetles have devastated the forests here which is very sad. But here is a good use for the dead wood. Looks kinda cool, huh? T-rex looks SO much better. Peck peck, is this iPhone good to eat? We moved! Now we are residents of Boulder County. It was a massive undertaking but totally worth it. And yes, we brought our chickens. 21 hours in the subaru together was interesting. But, everyone loves the space we have here, especially Shorty who no longer has to fear the Muni buses. 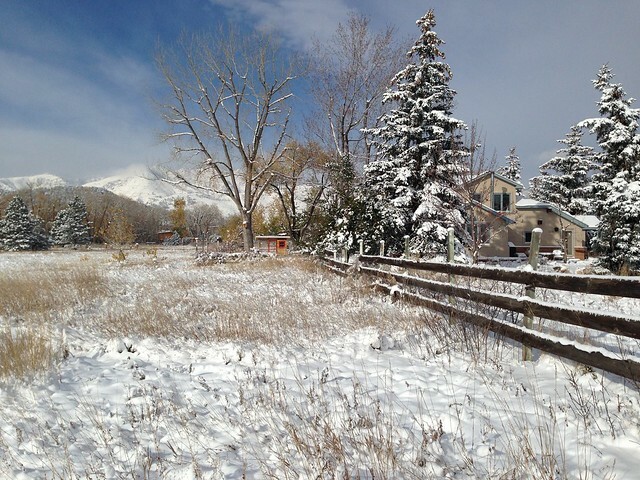 We now live in the country on 9 acres just 10 minutes north of Boulder. The best part about this place is living with seasons and the gorgeous, ever changing sky. 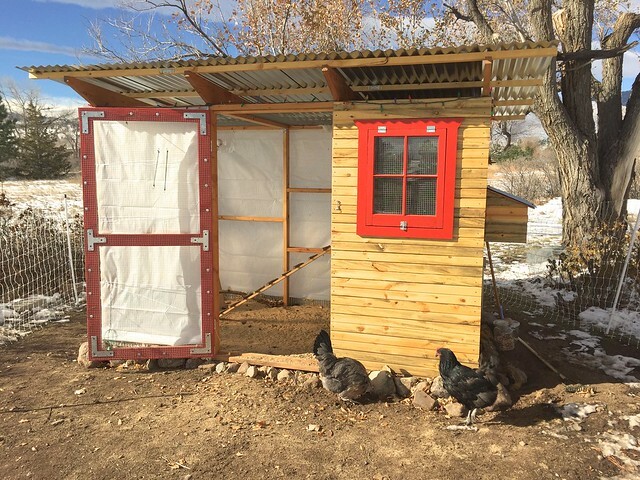 Endless projects await us – we finished most of the chicken coop before our furniture even arrived and next is transforming our barn into a machine shop and creative studio. We have to pinch ourselves daily – we actually live here!